A managing director who falsely claimed to have been a decorated Royal Navy Captain will not face any criminal charges. Imposter Stuart Elliot duped servicemen - including Falklands hero Simon Weston - into thinking he had commanded ships during the 1982 Argentinian conflict. However, despite admitting his deception, he has escaped with a police warning. The punishment has sparked fury among those he duped, including genuine war veterans. Elliot is understood to have claimed to have been a Falklands veteran who served aboard HMS Coventry, a destroyer sunk on May 25, 1982, with the loss of 19 crew. He even turned up to memorial services for 20 years decorated in medals. Falklands hero Simon Weston was even invited to open the premises of Elliot's company. However, in reality, the most the father-of-three had done was to serve on a Hull tug-boat set to 'mop up' debris left over from the Falklands war. He was sent to the islands to relieve the crew of the Irishman some three weeks after the invading Argentine force surrendered to British forces. Elliot claimed to have been a Falklands veteran, like hero Simon Weston It is thought Elliott, a married 52-year-old, may have been living his lie for 20 years before officers arrested him on suspicion of fraud and offences under the Uniforms Act 1894. Elliott was convicted of drink-driving in 2010 and, when applying for his licence back, told the DVLA he was a Captain. Despite admitting his deception, Elliot escaped facing a court over his lies and was instead given a police caution. Elliot's fantasy was exposed when 87-year-old veteran Frank Stevenson noticed he was wearing his medals in the wrong order and that one ribbon - awarded to veterans of the 2003 Iraq war, was displayed upside down. 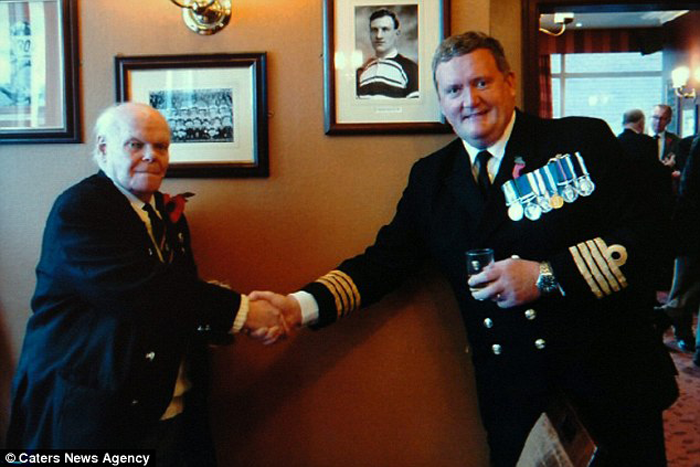 Mr Stevenson said he felt honoured when Elliott approached him at the Rugby Tavern in Hull, East Yorkshire, following a Remembrance Day parade at the city's war memorial in 2010. The veteran believed he was talking to an officer and even asked a friend to take the snap of the handshake. Stevenson, a pensioner who rose through the ranks to become a petty officer on board a warship, said he felt sickened and ashamed at being duped by Elliott. A set of 'dolphins', as worn by members of the Royal Navy Submariners Service, was also sported by Elliott. Both Royal Navy and Military of Defence sources said they had no record of Elliott having ever served. After he was exposed, Elliott was branded 'Walt' - an abbreviation of the name 'Walter Mitty'. The name comes from a short story by the American comic author James Thurber, The Secret Life of Walter Mitty, in which the eponymous hero fantasises about being a military hero. Following an investigation by Humberside Police and the Ministry of Defence, Mr Elliott received a verbal caution for fraud by false representation in relation to making a false declaration to obtain a driving licence. Mr Elliott, managing director of TC Power Ltd, a gas turbine maintenance firm based in Barton-upon-Humber, Lincolnshire, issued an apology to veterans through his solicitor. Max Gold said: 'Mr Elliott had no intention of upsetting or causing harm to any veteran. The investigation into Mr Elliott is now closed.